A no-hold-barred romp with dives, drives, bars, horseback riding, white-water rafting, dramatic islands and, perhaps, a romantic Bali wedding. Watch for those monkeys. ONE good reason to drive in Bali is the recurring opportunity to seriously contemplate and perhaps solve an eternal conundrum – why did the chicken cross the road? Or, for that matter, the dogs, the ducks and cows and just about everything with legs and wheels, just as you turn the corner, befuddled, wondering how the road signs could possibly point in three different directions, all for the same place? Welcome to Bali. Here among the scented frangipani, bougainvillea and floppy, pink tongues of mussaenda, the roads meander about in an other-worldly daze, transporting all comers to a state of grace. Slow down. Savour things. Where else in the world could you get a litre of petrol for 7,100 rupiah, a lot cheaper than a bottle of mineral water. Where in the world could you watch movies like Shaving Private Ryan or find welcoming frangipani flowers in the men's toilet at the airport? Forget timetables, rush and maps. Bali's spaghetti roads do not frequent that ordered world. They exist in a different time and space. The quicker you surrender to this notion, the sooner your family will stop moaning about deep vein thrombosis in the back seat. On with our Bali fun guide. Whichever direction you choose, there are billboard-size discounts. The Island of the Gods has been on sale for some years though the fresh influx of travellers has made discounts more elusive. The Indonesian rupiah trades at about US$1 = Rp13,300 and it simply couldn't get any better. Check our Bali Map and dive in. The most civilised means of getting around is by Kijang, a Toyota "Range Rover" which is far more comfortable than the highly manoeuvrable but denture-rattling Suzuki jeep. The newer model Kijang Innova now rents for about US$45 inclusive of third party insurance. Taxis are not always there when you need them and can be tiresomely expensive. Bali car rental companies include Bali Car Rentals (tel: [62-361] 411-499, 411-462, www.balicarrentals.com) who charge US$75 per day for a Toyota Kijang Innova with driver, and Bali Car Hire (tel: 411-499, www.balicarhire.com) with a US$65 daily price tag on a standard Kijang with driver. Prefer Bluebird taxis (simply, "blue taxi") and always insist on the metre. As a rough guide, a taxi from Nusa to Kuta will cost about Rp60,000 or more. Nusa to Ubud could be well in excess of Rp120,000. Not surprisingly, car hire makes sense. If your driver's name is Madé (pronounced maah-day), the same as your butler's and waiter's, fear not. Bali employs a wonderfully efficient naming system. The first child is called Wayan, the second Madé, the third Nyoman, and the fourth, Ketut. The fifth? Hmm. Women add the dainty prefix Ni (pronounced "nee"). Before you race off on a Bali temples tour please do take a minute to dress politely and hide that wobbling beer gut. You will be handed a saffron sash and a donation will be expected. This is left to your imagination. Be generous. And don't thrust flash cameras smack in the faces of priests or devotees no matter how tempting the opportunity. Most villages have three temples, the Pura Desa (the main complex and usually the most ornate), Pura Pusah (dedicated to Vishnu) and Pura Dalem (for Shiva). Even if you don't have a good eye for architecture, it is easy to figure out which is which. Just go to the entrance and check the name. There is a sign on each one. Apart from the obligatory flag-waving tour of Tanah Lot, the island temple in Kerobokan and its mystic-chant kecak performances, there’s always the amazing sunsets at Uluwatu Temple in the far south. This cliff-edge temple hosts hordes of marauding monkeys that will filch everything from sunglasses, hair bands, earrings and handbags to maps and cameras. I have seen the more irascible apes smack visitors’ imploring hands and continue to chew on a borrowed gold earring or more. The saffron sash for entry costs just Rp6,000 and those in unduly revealing apparel will be handed a sarong. Touts will try to sell you eats for the simians. Give that a miss and stroll about relatively unmolested. If robbed - and there is no better word to describe it - see if a temple groundsman can help get your bauble back by bribing the simian with a packet of peanuts. Or buy some corn and hold it out for an exchange. These primates are clever and conniving and literally operate like street gangs, waiting for your 'ranson'. Besakih (dedicated to the Hindu Trinity) is of course the largest and most stunning temple complex. It is also the farthest from the scrum, perched high in the central hill country. To imprint the map in the mind's eye, imagine Bali to be a plump chicken facing west. 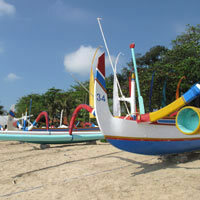 Nusa Dua is in the far south, Kuta and Legian occupy the southwest “breast”, Sanur the southeast and Ubud, the centre. If your imagination is not up to snuff, check our Bali Map. What's there to see and do? There are activities aplenty. At the Lakeview Hotel & Restaurant (tel: [62-361] 728-790) in Penelokan, perched high above the crater of Lake Batur, you'll get jaw-dropping wraparound views of Mt Batur, bursts of crimson cana lilies (and poinsettias in season), and a mediocre but extensive buffet for just around US$8. It’s embarrassingly cheap so don’t argue about the quality. Grab the corner table on the alfresco patio. There is a ticket to be purchased if you're driving into this scenic area. It costs around Rp10,000. Get in before noon to gain the best views before the clouds close in. Mt Gunung Agung rises up at the far side. Gunung Agung, a mightily revered volcano is a cranky gent that blew his top in 1963. The eastern flank, which bore the brunt of this outburst, remains a deserted Brobdingnagian landscape, a tossed salad of giant volcanic boulders and tall grass. A romantic ribbon of road snakes through it to Kubu and around the hump to Singaraja in the far north. From Lakeview it is possible to drive down into the crater and along the rim of the lake to the public hot springs. "Guides" are at hand to help you climb smoking, sulphurous Mt Batur. The route is fraught with steam, rocks – and the ubiquitous chess sets that locals are wont to sell at every corner. From Penelokan, or Ubud, you might venture north to the salt-and-pepper beaches of Lovina and Pemuteran in the shadow of the rainforest-clad hills. 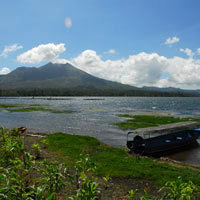 If you're heading up from Ubud, stop at Bedugul to enjoy views of Lake Bratan. 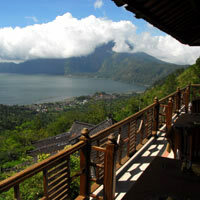 Do also try and visit the lush, terraced rice paddy of Kintamani. On the Ayung River, things were booming. BOOM. And then again, that sound. BOOM, BOOM, BOOM. The raft spun in the current and we froze. It was unmistakable. The reedy voice eclipsed the roar of the churning water. It was our Sobek guide filming the tour (to sell back to us later) trying to get attention. I wanted to swat him with a paddle but in the end we all stood up and smiled sheepishly. He was a very nice man. Not the sort you toss into a river. Sobek (tel: [62-361] 768-050, www.balisobek.com), one of the earliest rafting pioneers on the island, runs a fairly gentle family-friendly raft ride down the Ayung River as well as a more adventuresome white water rafting trip down Bali’s wilder Telaga Waja River. No Bali guide is complete without reference to these two rivers and runs. The Ayung River winds through Ubud paddy fields, rapids (but not the crack-your-head-on-a-boulder variety that you see on Extreme Sports), bathing pools, villages and pastoral scenes including women selling Coca-Cola and wooden chess sets who wade out and immediately drop the prices by half when your eyes glaze over. Ayung River runs have an average distance of between 8.5km and 9.5km. Add to that the rapids and even-more-rapid saleswomen. Sobek also runs delightful off-the-beaten-path cycling tours. Friends have tried the run downhill from Kintamani to Ubud. That's 25 or so kilometres, over three hours, with lunch and morning tea. Triple bypass not included. Or try a 4WD adventure. 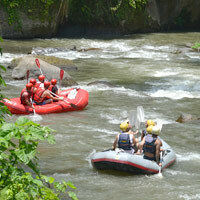 Another option is Mega Rafting (tel: 246-724, www.megaraftingbali.com), with similar offerings. Car enthusiasts might try the VW safari (US$85), where you will be wheeled around in classic Volkswagens. 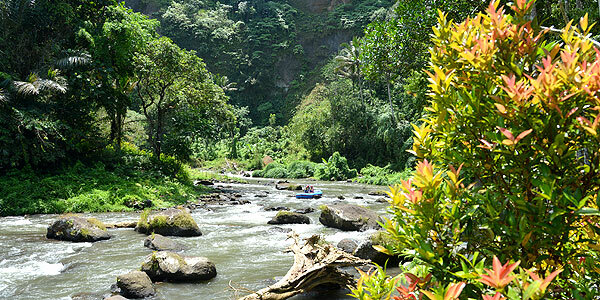 The Telaga Waja River in eastern Bali is faster, carries less traffic and the runs are longer, at 12km. More bang for your buck. The river races through precipitous gorges and dense jungle, past rice fields and waterfalls. For more adrenalin try Bali International Rafting (tel: 281-408, www.clubaquabali.com). Rafting rates start from US$77 for adults and US$57 for kids. Toss in US$75 and you can even have your own Nemo adventure with the Seawalker package, glass domed helmets and all. Bali Adventure Tours (tel: 721-480, www.baliadventuretours.com) organises elephant safaris, rafting, cycling, surfing, bird park trips, paragliding, and even elephant art exhibitions. With Waka Experience (tel: 484-085, www.wakahotelsandresorts.com/lifestyles) head off-road into the countryside and rainforest in a Land Rover, dive coral seas or savour a dinner cruise. Waka Experience also offers a string of small boutique resorts strung out across the island. Bali Hai Cruises (tel: 720-331, www.balihaicruises.com) has several options including a cruise with an overnight in a beach hut at Lembongan Island. Its packages have a little something for everyone, from dolphin spotting to cabaret dinners to parasailing, and more. For a full safari experience, try the Bali Safari & Marine Park. Stay at the Mara River Safari Lodge (www.marariversafarilodge.com), where you can view roaming zebras, rhinos, Indian white tigers, lions and oryx from the (relative) safety of your stilted treetop lodge. There’s also an aquarium, waterpark and elephant village. Or go on a safari and spot rhinos, Sumatran tigers, elephants, zebras, camels, Komodo dragons and more. The park stocks over 60 species and is a very child-friendly Bali fun option for when the temples get overwhelming. Kids can pose with lion cubs and pet animals or get up close with baby orangutans. The park is clean, well managed and staffed by bright young kids who are both energetic and attentive. Mara River Safari Lodge (see our Bali resorts review) has clean and comfortable accommodation too so you can stay and have your fill of the intrepid outdoors – with some gamelan music thrown in. Bali Diving Academy (tel: 270-252, www.scubali.com) can arrange a variety of underwater escapes. Also, Atlantis International (tel: 284-312, www.balidiveaction.com) offers classes on scuba diving, first aid, rescue diving and more. For more water and thrills and spills of a different kind there's always Waterbom (tel: 755-676, www.waterbom-bali.com) in Kuta, a water park with speed slides, a lazy river, kiddie park, and a lot more. The park occupies 3.8 hectares of landscaped garden and, in addition to water rides, offers a variety of spa treatments, dining, and a swim-up bar to offer a substantial distraction and pleasant escape for families with kids. Single day entrance is just about US$33 for adults and around US$21 for kids aged 2-12. Open from 9am-6pm. 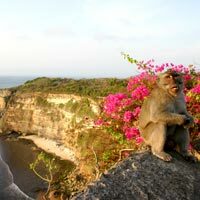 This is a hugely child-friendly Bali escape and worth a look if you are residing close by. If you prefer bumping around horseback and have a durable behind, try Bali Horse Riding (tel: 738-080, www.balihorseriding.com). Just US$30 will get you a romp on the beach and more including lunch. As they say “Go places only a horse can take you…” They recommend you bring a "change of clothes, shoes and towel” in case your horse decides to head out for a swim. The Yasa Bali Tour operators (tel: 782-4407, www.yasabalitour.com) also offer horse riding on the beach (US$45 for six hours). There’s also a multitude of other packages available, including sea walking, rafting, cycling, volcano climbing, elephant riding and more. Golden Kuta Tours (tel: 889-7488) does a tour of archaeological hotspots, and Sekar Bali Tour & Travel (tel: 278-1815) offers aquatic activities like jet ski, parasailing, snorkelling, banana boat and more. Kuta Beach sparks to life at sunset. The hair-braiders and masseuses who chased me up and down on a much earlier visit insisting I was Saddam Hussein (which prompted me to shave my moustache) are still in evidence these days. A great option is to visit some of the outlying islands to sun, laze, or dive. One of the more popular is Nusa Penida, a speedboat ride from Benoa or Sanur. Quiet, dry, large and brooding Nusa Penida appeals with its soaring limestone cliffs enclosing white sand beaches, an array of birdlife, and caves with mystical significance. A good resource with visual references is at this Nusa Penida site. Regular public ferries also ply these routes. Try a Bali Hai Cruise (www.balihaicruises.com) to Nusa Penida with a spot of snorkelling and a stop at Bali Hai's private beach set-up. this is not an island for noisy party activities and jet skis. Must-sees include Pasih Uug (Broken Bay) and the stunning vertiginous viewpoint at Karang Dawa from where you peer doen at white sand and pounding surf. Don't forget that selfie stick. For a more active island outing take a Scoot Cruise (www.scootcruise.com/) speedboat to Nusa Lembongan (around 30 minutes) and the neighbouring Ceningan, both just off the Nusa Penida northwest coast that faces Bali; or farther to the three Gili islands (via Senggigi in Lombok with its giant turtles). Scoot also has half and full day tours of Nusa Lembongan. On Lembongan take a look at local seaweed farming, visit caves, marvel at corals, or enjoy water sports. A full day cruise here costs Rp195,000 for adults and includes snorkelling and a trip on a glass-bottom boat. At Gili Trawangan try the beachfront thatch-roof cottages of the Jambuluwuk Oceano Resort Gili Trawangan (www.jambuluwuk.com/gili) with pool, gardens, free WiFi and even a meeting room for 40 should your company be in the mood for some barefoot team building. In Nusa Dua, in the far south, the revamped Bali Collection (tel: 771-662, www.bali-collection.com) complex serves up restaurants, designer shops, and even furniture. Of an evening you might even take in a dance show. Bali Collection is worth a quick browse for things like Polo, Quicksilver, Just Jeans, Surfer Girl, Roxy, D&G, PRADA, and assorted beach wear. Or browse the smart linen and Balinese lace outlet Uluwatu (tel: 772-066, www.uluwatu.co.id) that also has shops in Legian, Kuta, Sanur and Ubud. Uluwatu retails nice cotton blouses from around US$40 or so. The brand also has an online store where you can view its merchandise. You'll find it in the Grand Hyatt Bali's street arcade too. The touristy and large Art Market has a money changer and all manner of twee buys from shirts and blouses to masks and jewellery. Pick up a $5 t-shirt emblazoned with “Johnnie Wanker” or “iBoobs”. If you’re parked in the south, Nusa Dua is probably where you’ll start your Bali shopping whirl but the Bali fun shopping really happens in Seminyak, Legian and Ubud. 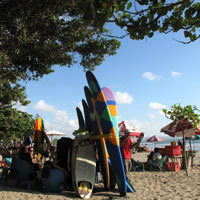 For wilder Bali shopping head to the Kuta bargain shops and sunset beach. The place has emerged beaming from the extensive drainage diggings and touts will attempt, politely, to lure you into newly decorated shops. Kuta has smartened up considerably. Thank heavens. While prices can be bargained down a fair bit, items are not cheap. A Billabong or Ripcurl t-shirt sells for over Rp180,000 (US$20). This is for originals. The knock-offs are often priced higher but can be brought down to around Rp80,000 (US$9) which is still more expensive than Hong Kong’s Causeway Bay. I have this on good authority - my teenage son, whose trousers are worn well BELOW the hip, so he should know. Cruise Jalan Legian for the most variety. Kuta bargain shopping includes spectacular knock-offs, of which there are many, none as brash and brilliantly organised as Bagus Watch (tel: 753-022), in the side street leading off from Starbucks and Hard Rock. The shop is set up with carefully stocked displays of everything from Rolex and BVLGARI to Omega and Tag Heuer. If you prefer the cool feel of cheap metal on your wrist – to be followed by the cold clamp of iron in your hometown hoosegow – this is the place for cheap fake watches, some of them quite stunning. 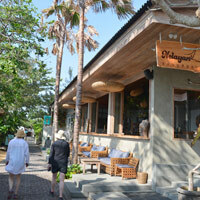 Also look out for furniture stores in Seminyak especially on the bypass to Kuta. Hardy on Jalan Kunti is one lively boutique option. Explore dining tables, cabinets, sofas, beds and more. Furniture can be custom-made and shipped. Ubud shopping represents the best of Bali as it is here that the island’s artistry finds choicest expression. The works may be brilliant or banal but this is a town that knows how to practise art. If you’re browsing art, try the Neka Museum (www.museumneka.com) or the Komaneka Gallery (www.gallery.komaneka.com). Head on to the handmade lace at Uluwatu in the Monkey Forest, Mozaic restaurant for that perfect dining table setting, Yan’s Antiques, or Toko Antique. The cheapest shopping – still pricey by Bali standards – is in the stalls around Jalan Monkey Forest leading south from the town square. Pick up DVD knockoffs for Rp15,000 (US$1.50), t-shirts, silver gewgaws, wind chimes, or a colourful sequined fish-bone slipper for Rp60,000 (US$7). You’ll come across hideaway alleys teeming with art and paintings, some pretty bizarre, some thought provoking and some rather accomplished. 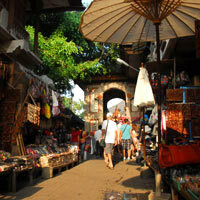 The best Bali shopping is of course in local villages, each specialising in a particular art or craft. Check out Batuan for art, Batubulan for magnificent, huge, stone carvings, or Celuk for intricate hand-wrought silver. Celuk is a nice stop en route to Ubud. Here, skills passed down through generations, are on display at dainty stores along the road where you'll find one-of-a-kind pearl and gemstone jewellery set in silver and gold. At swanker Celuk establishments, use the lifesaver loo (often marbled and usually clean) and then bargain hard. Around 30 or 40 percent off the asking price is a good place to start. At the far end of the Nusa Dua tourist strip is the former Bali Golf and Country Club with its 18-hole championship course. The greens closed for a major overhaul and returned late 2014 as the Bali National Golf Club. This revamping manicured green enclave is also referred to as 'The Maj' (the hospitality arm of the owning Ancora group) and encompasses seven private villas, the golf club, the David Leadbetter Golf Academy and a long-in-the-works Shangri-La. The new greens are designed by Robin Nelson and Rodney Wright (but serve up the same par 72 course). The New Kuta Golf (tel: 848-1333, www.newkutagolf.com) is close by the shopping and entertainment maelstrom of Kuta, the big sunsets beach with its surfers, designer stores and beer by the barrel. This is an unpredictable links-style course with shifting wind conditions and breezy sea views all around. According to impassioned general manager Rajakulasingham, "Hole 15 Par 3 set on top of brilliant white limestone cliffs, over looking the endless blue horizon of the Indian Ocean, can play anything from an 8 iron to a wood with the howling wind coming at you." Sounds fun. Expect a pro shop, practice range, an academy and a spa to work off apres-greens muscle achess. This is a par 72 championship 18-hole golf course set in 85 verdant acres and relatively accessible, depending of course on where you are coming in from. With the new Airport-Benoa bypass, New Kuta is now better connected to Nusa Dua, Sanur and Seminyak. The Jurassic Park setting of the Bali Handara Golf & Country Club (tel: [62-362] 342-2646, www.balihandaracountryclub.com), about a one-and-a-half-hour drive north from Nusa is a setting greener than a punk hairdo or the broccoli your mother fed you. The 18-hole green fee for in-house guests is US$85 and US$150 for visitors. This was a stunning course in its day but much of the former glory has faded in recent years. Still, it is a wonderful location. Ponder this. A deluxe room at this scenic Bali golf course will set you back just US$95 a night. All the 43 rooms face the course. Handara has seen better days and is in a bit of decline but it remains a stunning setting for golf in Bali. In the Canggu area try the Pan Pacific Nirwana Bali Resort (formerly under Le Meridien, tel: [62-361] 815-900, www.panpacific.com/Bali) next to the Tanah Lot temple. Set above the cultural pageantry of the brooding temple, the resort offers its signature 18-hole golf course to big-swing enthusiasts. 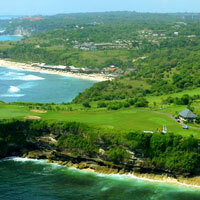 Designed by Greg Norman, the Nirwana Bali Golf Club course has won numerous accolades over the years. Time for a Bali wedding? If you are planning a Cinemascope Bali beach wedding and have the moxie to say, "I do", don your virginal whites and head to Tirtha Bali (tel: [62-361] 847-1151, www.tirthabridal.com), a splendid wedding chapel in idyllic surrounds in remote Uluwatu in the far south. They'll organise a complete church do or renewal of vows or hotel wedding if that's what you prefer. Browse their Italian dresses with delicate lace or go for something bolder, American, like Gone With The Wind. In Bali? Sure... Or get wed in a Bridal Suite at the Ayana Resort and Spa (formerly the Ritz-Carlton, Bali Resort & Spa), which offers some swish real estate and swisher cliffside wedding venues, a dramatic setting for those earth-shaking vows. Many Bali resorts like InterContinental Resort Bali, the Grand Hyatt Bali, Seminyak’s The Legian, the swish Bulgari Resort Bali and the romantic Amanresorts properties cater for weddings and various blessings and ceremonies are on offer. 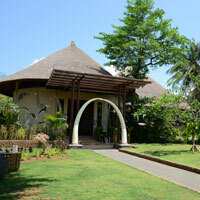 See our Asian Resort Weddings report. If you need a little help, Bali Weddings International (tel: 287-516, www.baliweddingsinternational.com) is happy to help you plan your big day. Consultants are on hand to help you plan all the little details, like the wedding registry and pre-wedding spa treatments, and you have your pick of spectacular locations, from beaches and cliffs to stately estates. Bali Weddings (baliweddings.com) offers similar services, and also handles honeymooners. A wedding ceremony starts from US$700, while renewals of vows are US$585. 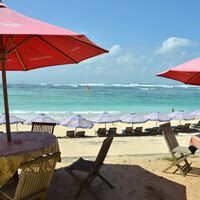 Bali dining options are varied though surprisingly expensive, all things considered, unless you pop into a small eatery. 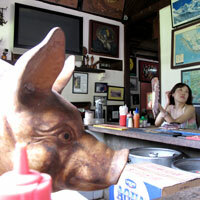 Try the local delicacy, "babi guleng" or roast pig, served whole, stuffed with Balinese herbs and vegetables. In the south, this dish is modestly spicy while in Gianyar it is sweeter. In the Kuta-Legian-Seminyak area fine dining and clubbing staples are many and varied. The fabulous Warisan restaurant, a boutique, art gallery and French restaurant rolled into one, with an alfresco courtyard overlooking paddy fields has sadly departed and become the ilLido Bali (www.illidobali.com/) serving 'classic' Italian. This is still a nice spot. The smart Metis restaurant bar and lounge (tel: 474-7888, www.metisbali.com) continues to attract a loyal following while Sarong and Bambu (www.facebook.com)are popular choices for Indonesian fare. The swish and expensive Ku dé Ta (Seminyak, next to Oberoi, tel: 736-969, www.kudeta.net) makes a fine spot for both sundowners and hearty breakfasts and remains the main crowd-puller on the trendy Seminyak strip. Get in early or make a reservation. Otherwise, no seats or views. Security at Ku dé Ta is tight and relentless. Inside there’s lots of space and a range of seating options from cool to open air. Do breakfast, brunch, or come in for a late night binge. Along the Seminyak strip just across from The Legian resort is the URCHIN Grill and Raw Bar (22 Jalan Lakshmana, tel: 904-2000, www.urchinbali.com/), where in neat grey stone and wood surrounds you'll be treated to some of the best steaks and homemade bread this side of the Suez. The service is friendly, the chef affable and enormously talented, and the stuff is cooked to perfection, far better than at a five-star venue. Pick roasted barramundi, bread-crusted hamachi, Angus tenderloin, beef tartar, oyster or sea urchin. Prices are not too steep and the wine pairings are great. For late nights with style and swing pop by the W Retreat & Spa with its hallucinogenic mood lights and breezy oceanfront bars, or The Legian for quieter upscale evenings. Bustling Jalan Lakshmana serves up great shops, eateries and bars like Rumours, Trattoria Cucina, Cafe Bali (a white wooden villa and a must for Italian or local, dishes from Rp45,000-Rp75,000), Kaizen (Japanese), Chandi, Mykonos (Greek), Ginger Moon, and Khaima (with its attractive bamboo shuttered windows). Kama Sutra Bali (tel: [62-361] 761-999) close to Alam Kul Kul at the northern end of Kuta Beach is a popular restaurant, club and late-night lounge while Blue Fin in Kuta (Jalan Kartika Plaza, tel: 764-100) serves fusion sushi. For Bali nightlife there's always the pounding Hard Rock Cafe (tel: [62-361] 755-661). The late-night disco 66 - Double Six re-emerged post 2011 as the upscale Double-Six Luxury Hotel (www.double-six.com/), which has a stylish 1,700sq m rooftop bar. The more formal Paparazzi Lounge with a dress code to ensure its funky interiors remain that way is in this vicinity. A much recommended spot for dancing the night away is the Potato Head Beach Club Bali (tel: 737-979, www.ptthead.com), where top DJs play to packed crowds, and patrons can cool off in the pool. Another option is the chill-out Cocoon. Check out the happening late-night Gado Gado restaurant and bar (Jalan Dhyana Pura, www.gadogadorestaurant.com) and Hu'u (tel: 736-443, www.huubali.com), which does lychee martinis and sports a pool - a swimming pool. The funky Sea Circus Restaurant & Bar (tel: 738-667, www.seacircus-bali.com) is the place to grab a bite and doubles as a fun Bali nightlife spot. Wander up the coast from Kuta to Seminyak of an evening you’ll find more than your fill of Bali bar and nightlife offerings. Up in Ubud the stylish and cosy Mozaic (tel: [62-361] 975-768, www.mozaic-bali.com) does French food with local twists depending on what's available in the market in season. This means the menu changes frequently. You’ll need to make a reservation. The Made Widjaya designed contemporary and hip Lamak (tel: [62-361] 974-668, www.lamakbali.com) on Jalan Monkey Forest attracts a die-hard crowd that enjoys cool environs, a good wine list, cocktails served in delicate – and always different – hand-blown glasses, and an exotic menu serving up everything from quail and lamb to chicken a-la Kiev. Start with a Van Gogh shot with absinthe. Hmm… Murni’s Warung (tel: [62-361] 975-233, www.murnis.com), tucked into the valley above a babbling stream, is an old-time favourite. Set on two levels with limited and intimate seating lit by small and smoky, if funky, kerosene lamps, the place does Indonesian to burgers and Indian curries. Also look at Café Wayan that serves Balinese in a more contemporary setting (cooking lessons also available), and the small roadside Naughty Nuri’s for chicken and chips, Japanese and more. Check out their dry martini, ribs, and the special tuna sashimi (Thursday nights). Nuri’s is cheap and cheerful at its unfussy best. 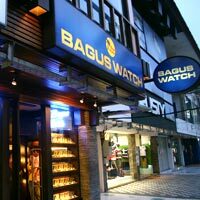 It has opened a second branch in Batubelig. In Sanur, the Wine and Cigar Bar at Pala (tel: [62-361] 283-835) remains a standout. Pala means nutmeg, which grows in abundance in The Moluccas. There’s more choice than you could shake a stick at here but for cheap Balinese fare you might try Lotus Pond (tel: [62-361] 289-398). Other options include this-and-that Kafe Wayang Bali (tel: 287-591) and, for Italian, The Village (tel: 285-025). In Nusa Dua, the Bali Collection (formerly Nusa Galleria) with its touristy shops and restaurants is favoured by Japanese guests and others who are not keen to venture further. It is a bit of a let down, enlivened modestly by a decent Japanese restaurant, Hanabi (tel: [62-361] 774-506), and occasional dance and music performances. A meal for two at Hanabi without drinks is around US$40. Other restaurants include Bali fusion Bawang Merah (formerly Paon, tel: 770-210), Tropical Bali Restaurant (formerly Coco Bistro, (tel: 773-735) that serves just about everything, and Uno for Italian. The big draw in the area, set in its own large compound is the Japanese Matsuri (tel: 772-267). Bumbu Bali (Benoa, tel: 774-502), not far from here, offers excellent Balinese fare in alfresco surrounds with a Balinese dance show to the accompaniment of gamelan music. The place has a nice welcoming ambience with good food and service to match. Try the pork ribs with jackfruit, or the chicken roasted in banana leaves. Something rather tasty and spicy is the soybean cake in turmeric sauce. Of course, the speciality at Bumbu Bali is the Balinese rijsttafel. The restaurant also has a popular thrice-weekly cooking class program. Heading back? The international departure tax at Bali’s Ngurah Rai Airport (also commonly referred to as Bali International Airport) is Rp200,000 (up from Rp150,000) and the domestic levy is Rp40,000. These taxes may soon be included on your ticket. Departures are faster at the new terminal though arivals can sometimes be maddeningly slow with the queues narrowing IKEA-style through duty-free at the end - a hair-pulling example of commercially-inspired user-unfriendly design. If you care for a spot of duty free shopping, a one litre bottle of 12-year-old Chivas is roughly US$37, a one litre Johnnie Walker Black US$38.50 and a 50ml EDP of Dior's J'Adore is US$95. A 7.5ml parfum bottle of Chance by Chanel will set you back US$158 with a Ferragamo silk tie weighing in at US$190. Heck, just buy some petrol and doggy-bag it back to Hong Kong or London or New York. Now that’s a real deal.